HomeZoologyWhat you should know about the infamous, yet fascinating, Black Mamba! Everyone in Africa, and even around the world, know of the Black Mamba. It is a feared and notorious creature, but few people actually know the truth about these remarkable animals! Here are some things you should know, that may make you think differently about them. I work with snakes full-time, and I often have the privilege of working with these majestic animals on a regular basis. There’s actually nothing I love more than getting called to remove one from someone’s home! So the below is from my experiences with them. The Black Mambas reputation is highly over-exaggerated. Fear and a misunderstanding contribute to this poor reputation, which is not deserved. A good few people have some sort of horror story, which often put these snakes in an evil light. Stories of them chasing down people, whether they’re walking in the bush or on horse-back, are not uncommon, nor are stories describing them as vicious killers. Black Mambas do possess some characteristics which could lead to these stories, but that doesn’t mean this makes them true. They really are unique and awe-inspiring, here’s why. Black Mambas are Africa’s largest venomous species of snake. There are stories of them reaching maximum lengths of 4m long, but those would be exceptional specimens! Adults average 2.2m-2.5m in length, and they also get quite thick. Often when people call me to remove one, they describe it to me to be as thick as gutter-pipe. What also happens, is people call me for a big python, and it turns out to be a 2.5m mamba. It’s a big and impressive snake! The thick body of a large Black Mamba is most certainly not fat, it’s pure muscle. Black Mambas are incredibly powerful animals, despite the fact that they don’t even constrict their prey like a python. They need this strength for their active lifestyle. They actively hunt down prey rather than ambushing it. So they spend a lot of time climbing trees, and they also need strength for male combat during the breeding season. To give you an idea of their strength, it takes at least four people to hold down a large mamba for measuring, even then it’s hard to get an accurate length. The heaviest mamba that I have captured weighed 4kg- a heavy mamba! Black Mambas are known to be one of the most aggressive snakes in the world. 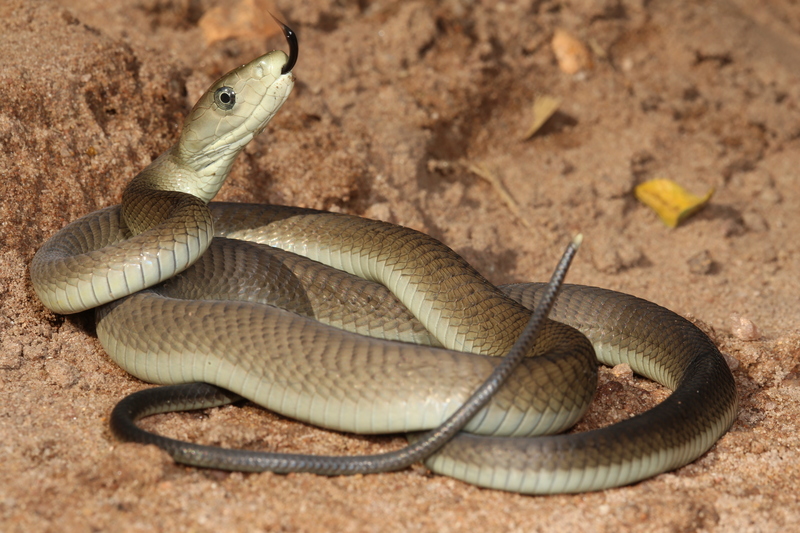 So when people see any dark-coloured snake, they think of the mamba and fear for their life! Black Mambas are not aggressive, they’re just very nervous and shy. They do not charge attack people, in fact I find that they’re almost more scared of people than any other snake. To see one in the wild, up close, would be really lucky. At best, you usually just get a glimpse of them disappearing into thicker bush or down a hole. They are very alert snakes, with excellent-working senses, so they usually sense you coming a long way away. They will always flee rather than fight, and are usually quick to disappear. In fact, they disappear very quickly, as they’re known to be one of the fastest snakes in the world! They won’t be faster than the average human, and reach speeds of around 12km per hour. If cornered, Black Mambas still do not charge at you, contrary to popular belief. A cornered mamba will sit and hold its ground. It will give you all the warning in the world to back off! It will either sit, waiting for you to leave it alone, after which it can retreat. Or, should you foolishly choose to attempt to come closer to kill it, it will lash out as soon as you’re within striking distance, so don’t do that! The Black Mambas defensive display is very intimidating, and this is probably the cause for many over-exaggerated stories. Their defensive tactic isn’t to give you nightmares, it’s just to put you off coming closer, which usually works. If a mamba is surprised at close proximity, it can raise the front third (if not more) of its body off the ground, and spread a narrow hood like a cobra. This makes it look even more impressive! To cap that off, if you’re too close, it will show you where it gets its name from – the inside of its mouth. The inside of their mouth is pitch black, where the name Black Mamba comes from. You’ll notice the body isn’t actually black, it’s a grey/brown colour. When a Black Mamba gapes at you, it is indeed an intimidating sight and it doesn’t look friendly! So mission accomplished for the mamba, as you’ll back off at this point. They practise this tactic whenever they feel threatened. Should someone discover a mamba in the house, at close proximity, they often don’t bother with the whole hood display. Opening up their mouth and pulling their scary face is often the easiest and most effective thing for them to do. Black Mambas are remarkably intelligent, and they’re actually creatures of habit. When threatened, they almost seem to calculate quickly what their next, safest move is. They will often take up residence in a particular area, where there is plenty of food and good shelter. They will have a hide-out where they come to rest in the evening, or to retreat to when threatened. They’ll also have a favourite basking spot, and often bask at the same time every day. I remember visiting a reserve near Durban, and a ranger told me where he often sees a mamba at 09:00am. I went back the next day at 09:00, and there was the mamba! I once got in between a basking mamba, and its hide-out. It was at the top of a flight of stairs, with the hide-out being at the bottom. By the top of the stairs was a busy road. When I approached from below, and got too close, it shot down straight at me. I tell people to freeze should a snake be near them, but I ran off of course! However, I could see that the mamba was focused on getting to its hide-out, and not me. It wasn’t showing signs of aggression, and I believe if I froze it would have moved straight past. I wasn’t brave enough to take that chance. One characteristic of the mamba that you have every right to fear, is their bite. 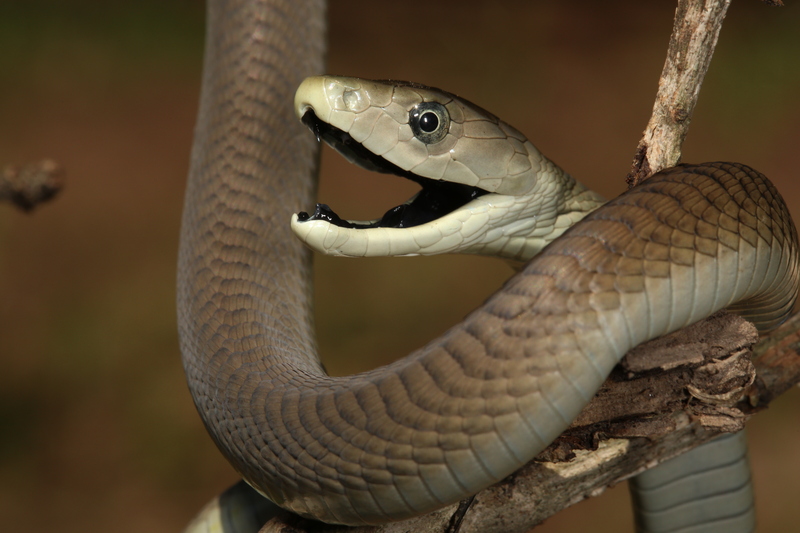 Before antivenom was created, a full envenomation by a Black Mamba was thought to be 100% fatal. Black Mambas have a potent, and fast acting, neurotoxic venom, which they inject with their front-fixed fangs. Symptoms include excessive sweating, slurred speech, drooping eyelids – it basically just shuts you down. It ends up paralysing patients, causing respiratory failure. Now isn’t that just a lovely thought? Well, the chances of you being bitten by a Black Mamba are next to none, unless you choose to harass one. Recently, a man almost lost his life to the bite of a mamba, as he was bitten while trying to beat one with a stick – a fantastic example of why you should leave them alone. Accidents do happen of course, and people who surprise a mamba could become very unlucky. Fortunately, there is a polyvalent antivenom available, which can save a life. The best thing to do if someone is bitten by a mamba, is to transport the patient promptly to hospital (a pressure bandage will buy precious time). If one can get to a hospital within an hour, chances of survival are very high. Sadly, mamba and dog conflict occurs on a regular basis here in South Africa. It’s not either one of the animal’s fault. Dogs see a mamba and attack, out of instinct and probably to defend their owner. Black Mambas are often left with no choice other than to defend themselves. It happens so often, where three or four dogs corner a mamba in a yard, injure or kill the snake, but soon pass away themselves, due to the fast acting venom. Unfortunately there’s not much one can do to prevent this. Let us remember, that venom of the mamba isn’t intended for us humans, or to kill animals for fun. It’s just for killing their prey. Black Mambas feed predominately on rodents, but also take young dassies, birds and lizards (as youngsters). If you breed rabbits, guinea pigs, pigeons or birds, then you’re basically inviting a mamba for a free and easy meal. They are also known to eat kittens. They must be one of nature’s best pest-controllers. I have often removed unwanted resident mambas, but despite being unwanted by the people, they often acknowledge that their rat problem has disappeared. I guess it’s safer for the mamba to be away from people, for both parties. So as you can see, Black Mambas serve a purpose on this planet, like all wildlife. They help maintain a healthy ecosystem by keeping certain animal numbers in check, and are also food for other animals (especially when they’re juveniles). One other reason why these snakes deserve to be protected! Black Mambas are simply awesome animals. They truly are one of the icons of Africa. They really are awe-inspiring, and demand a lot of respect, not fear! It’s one of my favourite animals, and I just think that they’re amazing. I love them, and I hope more people can do too. To follow what I do, you can like my Facebook page ‘KwaZulu-Natal Amphibian & Reptile Conservation’, or visit my website and check out the blog. 4 Comments on What you should know about the infamous, yet fascinating, Black Mamba! I just love your stories, Nick. Specially those of the Black Mamba’s. Keep it going! Excellent article – many of the characteristics of the Black Mamba seem to apply to most snakes in their choice of escape over confrontation if an escape route is possible. I wish snakes in general were given the respect and credit which is their due! It would mean more lives (both snake, human and pet) would result! The Indian Army (Special Operations Group) is extremely fascinated with these snakes and has begun to breed them in large numbers in special facilities on the Kiltan island of the Laskhadweep archipelago off India’s South Western coast. This is a special operations no go zone and is directly under the Defense ministry. Here Indian Soldiers also arrive for training courses and practice snake handling techniques and there is also a venom extraction center on the island.